Interior of old Orange meeting hall houses Victorian English paintings and the contemporary bronzes of Adrian Sorrell (RCA) 1932-2001. I had been looking forward since it’s April opening to seeing the exhibition “Beauty In The Beast – Animals as Objects & Art”, and last Tuesday I finally made the roughly 100 km drive northwest of Toronto to the Dufferin Museum to see it. I was expecting to be impressed, but to put it mildly, I was blown away. More succinctly, I’d have to say absolutely gobsmacked. It is an outstanding display of all things animal, and I drank it in for over two hours before finally succumbing to “visual overload”. I left knowing that I would have to make a return trip to further take it all in before the closing date of December 22. Initially I was struck by how beautifully the impressively large barn-like structure of the museum blends in with the surrounding rolling farm country. Inside it is open and airy, and includes three full sized historic structures -a log cabin, an Orange Lodge meeting hall, and a railway flagging station. The current exhibit is on display throughout. There are animals everywhere you look. And who doesn’t love looking at animals? After looking at ourselves, it is possibly our next favourite subject in art. It goes back to the first caveman drawings. I image the order was, himself, his wife, and then the animal he hunted, and depended on for his very sustenance. Landscapes came later. What’s amazing here is how the literally thousands of depictions cover almost every type of relationship we have with animals, and while viewing it, at times I was surprised by an almost primal emotional response which welled up from deep within. Animal effigies and Inuit carvings next to pastoral scenes of cows, horses and sheep, childhood memories of fantastic creatures and portraits of the family pet. The iconic and the mundane. Animals feared and animals worshiped. Animals past such as an American 1880 copper grasshopper weather vane, an Egyptian brass cat, dated 200-210 B.C., 2nd century BC, 3rd and 4th century Netsuke carvings from Japan. 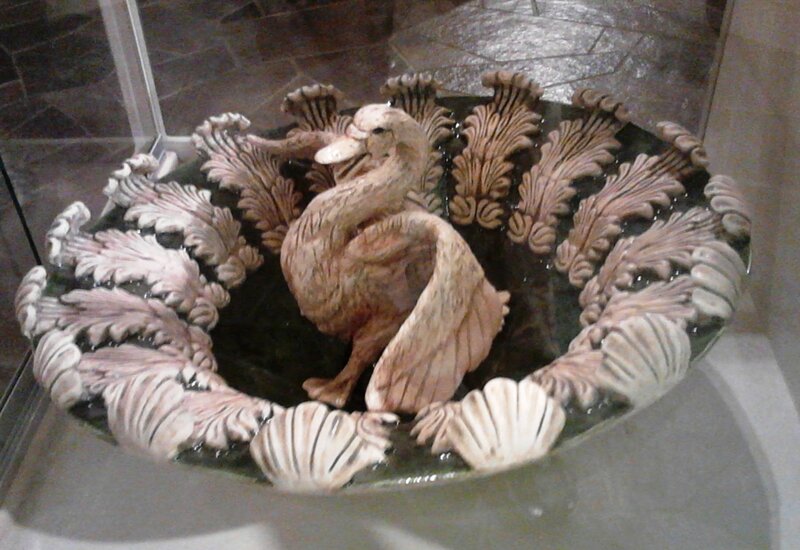 These along side present depictions of animals by several contemporary Canadian sculptors include Marina Fricke, E. B. Cox, Clifford Neil and Calgary’s Gary Williams who produces brilliant large Majolica pottery pieces. Plus, and these alone are worth the price of admission, there are 5 stunning bronzes by the brilliant English sculptor Adrian Sorrell, shown in the photo up top. And there is a lot of great, funky, funny folk art, past and present, which is guaranteed to make you, (and your kids if you’ve got them), smile. 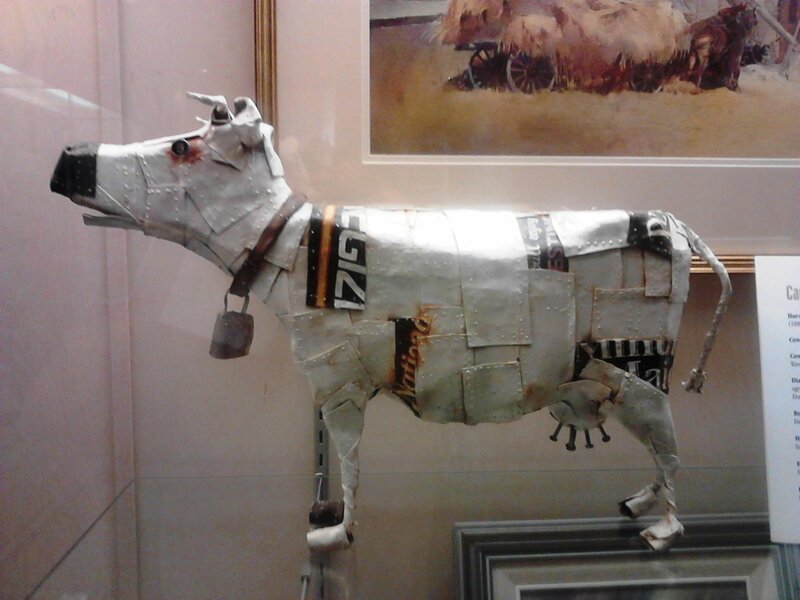 You just can’t help yourself when you look at the rusty tin covered cow by Contemporary Quebec artist, Patrick Amiot. Well, actually Mssr. Amiot now lives near San Francisco (I googled him), but you can see why we want to continue to claim him. 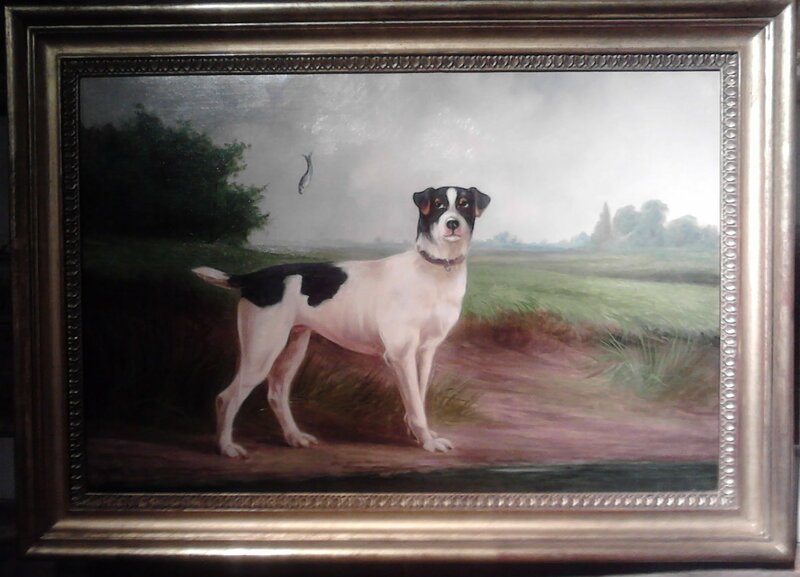 Folk art fans will see many of their favourites including a few stunning miniatures by the master, William Loney (1878-1956) of Prince Edward County. They are in a charming, glass 6 sided gazebo which was brought in to house the miniatures. You can lose yourself there for a long stretch, Ill tell you. There is some fantastic animal related furniture as well, and a tree of life quilt which is to die for. It just doesn’t stop. 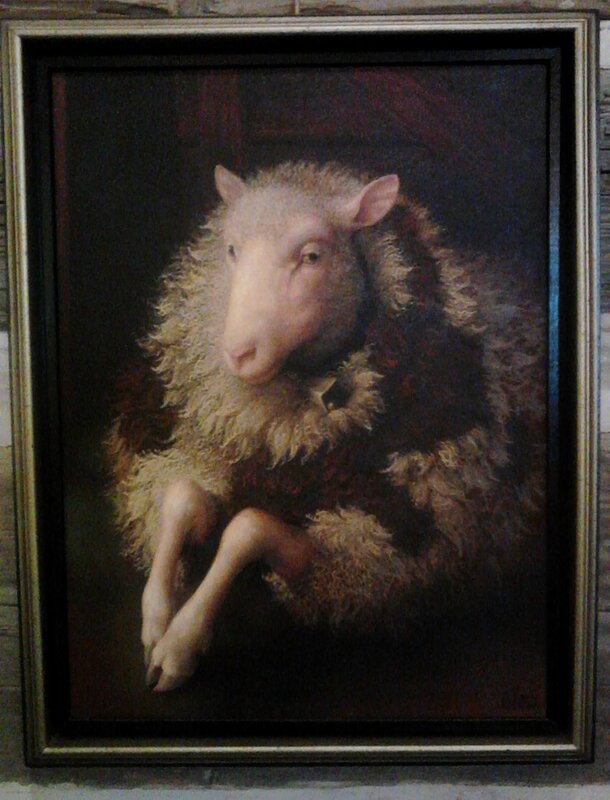 “A lady sheep, Isabella Brandt, Ruben’s much loved first wife”, oil on canvas by Canadian Lindee Climo. And I could go on at length about the contemporary art. Surreal dream-scapes by Gilles Genest, with titles like “Kangaroo’s picnic”, and “Full moon, white cats and hydrangea”. Also fascinating is the exquisite work of Nova Scotia’s, Lindee Climo who paints animals in the style of the Old Renaissance Masters. So how can I best express how strongly I feel that this is a first class, once in a lifetime, drop everything to rush out and see exhibition? I think I just did. Go see it.